The time is upon us. Winter school vacation time. A glorious time for kids, but a nightmare to the wallets for their parents. 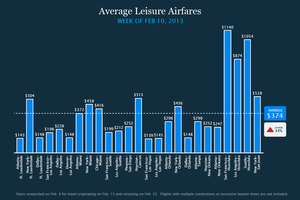 This year is no different, as leisure airfare prices have gone through the roof this week. Business airfare is down once again -- not quite enough to offset the leisure jump, but still down for the seventh straight week. Hotels are down overall for the first time in a few weeks, though the big cities are still showing sky-high prices. 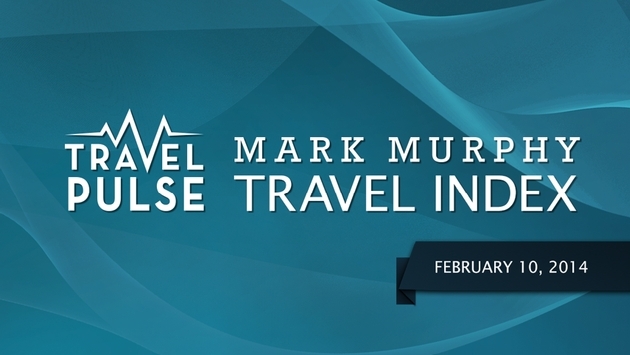 To be clear: Our numbers are based on research done last week looking for fares and rates for the Feb. 10-18 window, except for leisure airfare, which was researched for the week of Feb. 15-22. - : Fare are up a whopping 34 percent for travel during the traditional “school vacation” week, with prices up across the board on flights to Ft. Lauderdale, Orlando, Miami and Hawaii. - Vacationers can expect to pay more than $500 to escape from New York to Florida, and ticket prices between San Francisco and Honolulu have doubled since last week. - There are a few bargains left for sun seekers out West, as ticket prices are lower between Seattle and Los Angeles (down ­35 percent), and San Francisco (­down 30 percent), and ticket prices between L.A. and San Francisco are still under $200. - Watch for United gate agents to start cracking down on carry­on bags. In March, the airline will launch a system­wide push to insure that only carry on bags that fit the specifications are allowed on board, and that passengers bring only the number of bags allowed on board. - In other United news, the airline is cutting service in Cleveland. Daily departures will be reduced 60 percent by June. - DFW airport will raise parking feels on March 1. Driver will be charged $2.00 to park for 30 minutes, or $1.00 if they use a Toll Tag. Rates will increase to $3 from $1 to park between 30 minutes and two hours. - Ticket prices continue to slide for the seventh straight week, with fares down an additional 3 percent. - Bargain seats abound on transcontinental flights, with airlines offering low fares and extra frequent flier miles to entice business fliers. - Although prices on most routes are either lower or unchanged from last week, fares are higher out of Dallas, with ticket prices up on flights to Los Angeles (up 31 percent), Chicago (up 47 percent) and Atlanta (up 13 percent). - Check out the new workout facility at Toronto’s Pearson International Airport located in Terminal 1, arrival area F. Passengers can purchase a daily pass for $5, and enjoy use of the exercise room complete with weights, elipticals and treadmills. Locker rooms with showers are also equipped with soap and shampoo, and guests can rent Reebok workout clothes and shoes. - American is offering a 30 percent bonus on AAdvantage mileage purchased before February 28. Members who purchase between 20,000 and 29,0000 miles will earn 5,000 miles, 30­-39,000 miles nets 8,250 miles, 40-49,000 miles awards 12,000 miles and purchases totalling 60,000 miles or more will earn 18,000 bonus miles. In other American news, AAdvantage members can earn up to 3,000 for Avis car rentals made through March 31. - Virgin America is offering up to 10,000 bonus points for transcontinental flights between San Francisco or Los Angeles and select East Coast cities through April 9. Passengers must register in advance, and tickets must be purchased before March 31. - Once again, polar opposite trends here. 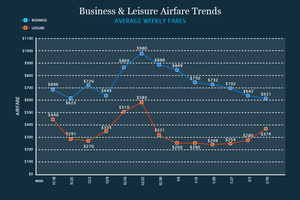 Leisure fares are up big, while business fares continue falling. - For leisure, prices are up $94 on average this week, only around $200 cheaper than the peak holiday prices. 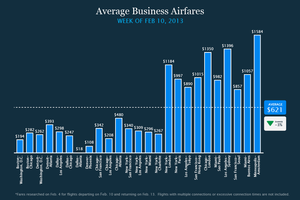 - Business fares are down once again, dropping $21 on average this week. It's the seventh straight week of price drops, and the lowest business fares we have seen since we began our weekly survey in early November 2013. - Room rates have dropped slightly for the first time in several weeks, but average prices register more than $300 a night in several cities including New York, Washington, Miami, San Francisco and Los Angeles. - Rooms in the Bay Area are hard to find, thanks to large technology and healthcare conferences. - Miami is hosting a large religious conference, as well as a gathering for global investors. Chicago welcomes the College Art Association and the Association for the Advancement of Science. - Several properties in Nashville and Houston are sold out, and visitors to Las Vegas will mix it up behavioral scientists, conference attendees interested in fatherhood and families and Digital Signage. 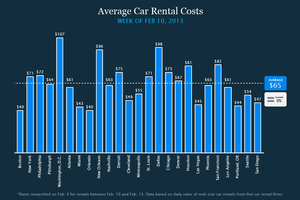 - Car rental rates remain unchanged this week, but prices remain high in several cities, including Washington, D.C. ($107/day), New Orleans ($96), Dallas ($98) and San Francisco ($82). - Visitors planning to rent a car in Denver next week will have a range of vendors and prices to choose from: daily rates for a mid­size car range from as low as $7 per day with Payless to $146 per day from Hertz. 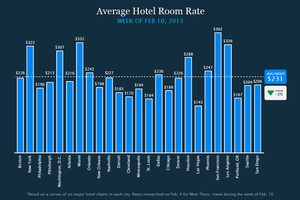 - Hotels fell slightly this week, down $4 on average. But prices are still just $13 cheaper than our highest survey price average during the week of Nov. 18, 2013. 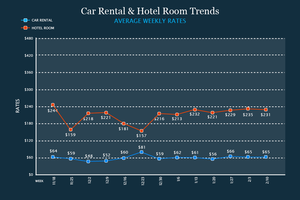 - Car rentals are flat this week.